After I got it home and washed, I looked through my recipes to see what which variety to make. 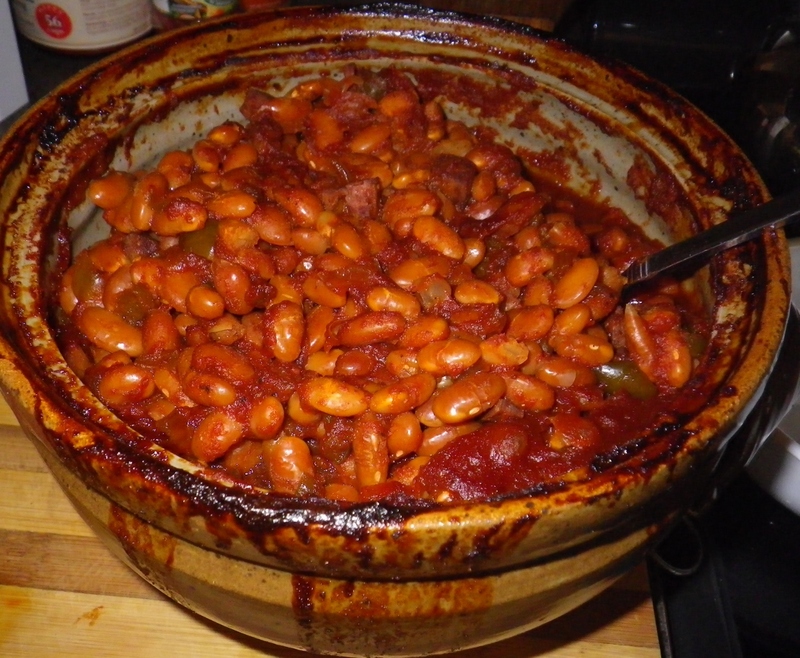 I chose my recipe for Campfire Beans , a lighter alternative to the New England favorite, Bean Hole Beans. Recently moved to Tennessee and in homage to the new home-ground I decided to use traditional sweeteners of the Smoky Mountains, sorghum and honey, in place of molasses. As soon as I started, I realized there was something I overlooked. I usually make beans in my 10-inch, 5-quart cast iron Dutch oven. The bean crock is not that big; it is about the same size as my 8-inch, 2-quart Dutch oven. That means there is no room in the pot for the beans and a big ol’e ham bone. I have to re-think my usual recipes intended for the Dutch oven and do a bit of resizing and substitution to accommodate the smaller pot. Some time ago, I came across 5-ounce cans of diced ham in the supermarket canned meat section. I was a bit leery at first but tried a can just to see. It was actually quite good and a good substitute for a bit of fresh diced ham say for an omelet when a larger piece if eat would be a waste. I keep several in the pantry and I use a can in this, my first bean crock endeavor. Also, I added a bit of liquid smoke to add the flavor that would have been imparted by wood coals of I were cooking the beans in a hole in the ground. I managed to get everything to fit into the pot. There are a lot of canned beans out there and some are very, very good. However, they will never be as good as the beans you prepare to your own personalized recipe. If you haven’t done so already, go ahead and try it. It really isn’t all that hard. Just use this recipe as a starting point and go from there. Sort and cull beans. 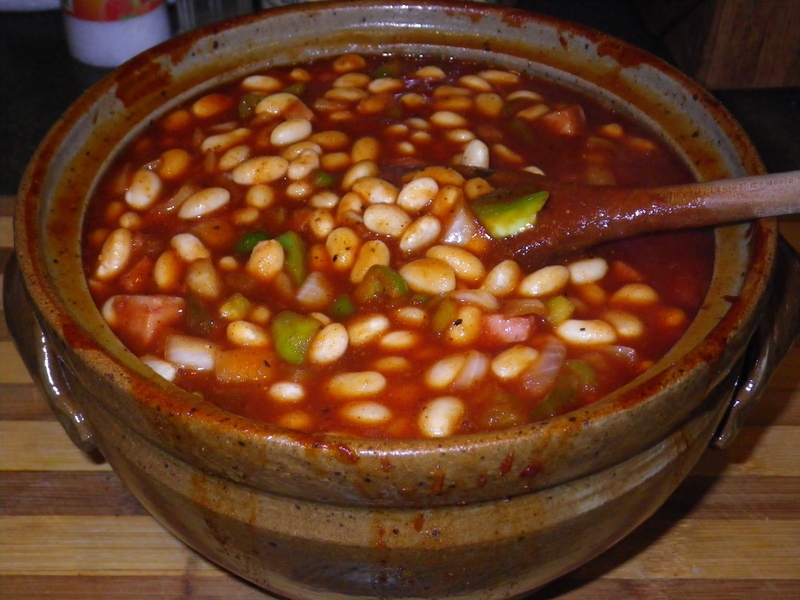 Place the beans in a bowl or pot with a lid. Cover plus 2-inches with boiling water. Cover and set aside until cooled, about 2 hours adding a bit of water if needed to keep covered. When cooled, add enough cold water to cover by2-inches, cover and let sit overnight in the refrigerator. The next day drain and rinse the beans in a colander. Place the beans in a large pot and cover with cool water. Heat over medium-high heat and slowly bring to a boil. When the boiling starts reduce the heat and slow simmer for 15 to 20 minutes. 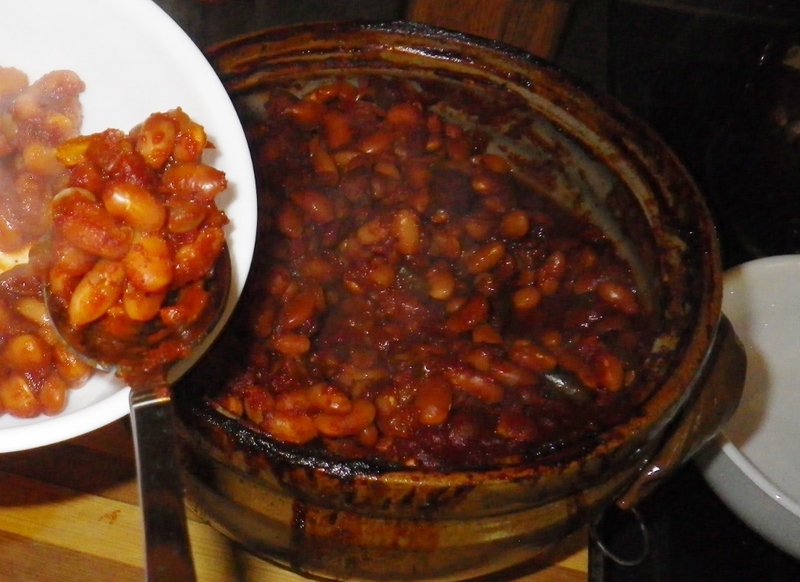 Check the beans – if not bite tender, simmer additional time. Be careful not to overcook – there will be additional cooking time in the oven. 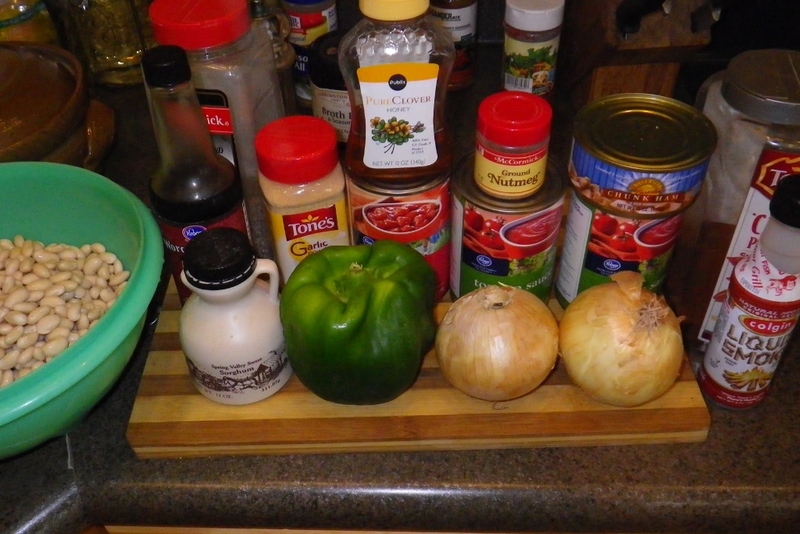 While the beans are cooking, dice the onion and green pepper. Place the onion and pepper in the bean rock. Drain the canned ham. Add the ham, including any small morsels of fat, to the bean crock. Add the diced tomatoes and one can of the tomato sauce to the bean crock. Reserve the second can of tomato sauce until you see how full the crock becomes. Add liquid smoke, seasonings and sweeteners to taste. Drain the cooked beans. Add the beans to the bean crock and gently stir to mix all the ingredients. Add tomato sauce as needed to fill the crock. Cover and place the crock in a preheated 425°F oven. A cookie sheet on the rack below is helpful during cleanup. Reduce the oven setting to 325° and cook for 20 minutes. Reduce the temperature to 225° and bake for an additional 1 ½ hours. Carefully remove the hot crock from the oven to a heat proof surface. Carefully open the lid. Stir gently to mix the ingredients. Add additional tomato sauce or water as needed to keep the bean crock full. Recover and return the crock to the oven for an additional two hours. After the four hours of baking, the beans should be ready to eat. Careful! They will be hot.